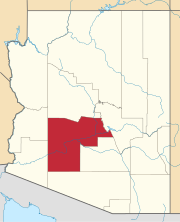 Mesa (/ˈmeɪsə/ MAY-sə) is a city in Maricopa County, in the U.S. state of Arizona. It is a suburb located about 20 miles (32 km) east of Phoenix in the East Valley section of the Phoenix Metropolitan Area. It is bordered by Tempe on the west, the Salt River Pima-Maricopa Indian Community on the north, Chandler and Gilbert on the south along with Queen Creek, and Apache Junction on the east. Mesa is the largest suburban city by population in the United States, the third-largest city in Arizona after Phoenix and Tucson, and the 36th-largest city overall in the US. The city is home to 496,401 people as of 2017 according to the Census Bureau, which makes it more populous than major cities such as Minneapolis, St. Louis, or Miami. Mesa is home to numerous higher education facilities including the Polytechnic campus of Arizona State University. It is also home to the largest relief airport in the Phoenix area, Phoenix-Mesa Gateway Airport, which is located in the southeastern corner of the city. The history of Mesa dates back at least 2,000 years to the arrival of the Hohokam people. The Hohokam, whose name means "All Used Up" or "The Departed Ones", built the original canal system. The canals were the largest and most sophisticated in the prehistoric New World. Some were up to 90 feet (27 m) wide and 10 feet (3.0 m) deep at their head gates, extending for as far as 16 miles (26 km) across the desert. By A.D. 1100 water could be delivered to an area over 110,000 acres (450 km2), transforming the Sonoran Desert into an agricultural oasis. By A.D. 1450, the Hohokam had constructed hundreds of miles of canals many of which are still in use today. Mormon pioneer Daniel Webster Jones, with Henry Clay Rogers as his right-hand man, led an expedition to found a Mormon settlement in Arizona. Leaving St. George, Utah in March 1877, Jones and others arrived at Lehi, an area within the northern edge of present-day Mesa. Jones had been asked by Mormon officials to direct a party of people in establishing a settlement in Arizona. This settlement was initially known as Jonesville and Fort Utah and did not receive the name of Lehi until 1883, when it was adopted on the suggestion of Brigham Young, Jr.
After the founding of the city the elected official that most impacted the municipality was George Nicholas Goodman. He was mayor 5 different times in parts of 3 different decade (1938-1942, 1946-1948, 1952-1956) (see: List of mayors of Mesa, Arizona). As mayor he was directly involved in the process of acquiring land for both Falcon Field and Williams Field. With the opening of Falcon Field and Williams Field in the early 1940s, more military personnel began to move into the Mesa area. With the advent of air conditioning and the rise of tourism, population growth exploded in Mesa as well as the rest of the Phoenix area. Industry—especially early aerospace companies—grew in the 1950s and 1960s. As late as 1960, half of the residents of Mesa made a living with agriculture, but this has declined substantially as Mesa's suburban growth continued on track with the rest of the Phoenix metro area. Mesa employs a grid system for street numbering that is different from that used in Phoenix and other portions of the metropolitan area. Center Street, running north to south, bisects Mesa into eastern and western halves and serves as the east and west numbering point of origin within Mesa. Streets west of Center St., such as W. University Drive or W. Main St. are considered to be in West Mesa, whereas streets east of Center St., such as E. University or E. Main St., are considered to be in East Mesa. Mesa Drive, running north to south and bisecting Mesa into east and west sections, is located 0.5 miles (800 m) east of Center Street, and serves as the zip code boundary between the 85281, 85201, 85202, and 85210 zip codes of Western Mesa and the 85203, 85204, 85205, 85206, 85207, 85208, 85209, 85212, 85213, 85215, 85220, and 85242 zip codes of Eastern Mesa. Country Club Drive, running north to south and bisecting Mesa into east and west sections, is located 0.5 miles (800 m) west of Center St, and serves as the jurisdictional boundary between Arizona's 5th and 6th congressional districts. Note that this same road (as Arizona Avenue) serves as the official east and west numbering point of origin within the city of Chandler, located south of Mesa. Located in the Sonoran Desert, Mesa has a hot desert climate (Köppen: BWh), with mild winters and very hot summers. The hottest month is July, with an average high of 106 °F (41 °C) and an average low of 77 °F (25 °C). The coldest month is December, with an average high of 67 °F (19 °C) and an average low of 41 °F (5 °C). As of the census of 2010, there were 439,041 people, 146,643 households, and 99,863 families residing in the city. The population density was 3,171.3 people per square mile (1,224.4/km2). There were 175,701 housing units at an average density of 1,405.7 per square mile (542.8/km2). The only highrise in Mesa is the Bank of America (formerly Western Savings) building near Fiesta Mall. Numerous properties in the city are considered to be historical and have been included either in the National Register of Historic Places or the listings of the Mesa Historic Properties. Mesa has over 2,280 acres of parkland in the city limits. Its largest is Red Mountain Park which spans 1,146 acres. It includes a lake, playgrounds, a basketball court and a cement volleyball court. Mesa is home to numerous championship golf courses, including the original course in town, Mesa Country Club. This course was founded in the late 1940s by the original leaders of the town, and "Country Club Drive", the most prominent street in Mesa, was at one point the modest entrance to the club. The Fiesta Mall is located in West Mesa, and owned by Westcor. Its anchors are Sears and Best Buy. It is located near several shopping centers, Mesa's Bank of America, and other retail stores, banks, and restaurants. An expansion of the mall has been planned. Mesa Riverview is a new outdoor destination retail center in the northwestern corner of the city, near Loop 202 and Dobson Road. At build-out the center will include 1,300,000 square feet (120,000 m2) of retail space. Its anchors include Bass Pro Shops, Cinemark Theaters, Wal-Mart, and Home Depot. Located in East Mesa is Superstition Springs Business Park. It includes the Superstition Springs Center, a shopping mall owned by Westcor. It features an outdoor amphitheatre and fountain which convert to a stage. Anchor stores at the mall are Dillard's, JCPenney, Macy's, and Sears. Mission Community Church, previously known as Superstition Springs Community Church, was initially named after this business park. Mesa is a delegation of Special Olympics Arizona. This team includes track & field, kayaking, swimming, basketball, bowling, and golf. Almost all of the city of Mesa is served by public schools operated by Mesa Public Schools; however, a small southern portion is served by the Gilbert Public Schools and the Queen Creek Unified School District, and a small western portion is served by the Tempe Elementary School District and the Tempe Union High School District. Several area freeways serve the Mesa area, such as U.S. Route 60, locally known as the Superstition Freeway, which runs between Apache Junction and Phoenix. It is also served by SR 87 and bypass loops Loop 101, which skirts the western city limits as the Price Freeway, and Loop 202, which bypasses the city on the north and east. Public transportation in Mesa is provided by Valley Metro via bus and light rail (Valley Metro Rail). The light rail section in Mesa spans about four miles from Sycamore/Main St in the west of the city, through downtown to Mesa Dr/Main St. Until July 2008, Mesa was the largest U.S. city with no public transit service on Sundays, but now has Sunday service available on Routes 40-Apache/Main, 61-Southern, 96-Dobson, 108-Elliot, 112-Country Club/Arizona, 156-Chandler/Williams Field, and 184-Power. Air service in the city is provided by two airports. Falcon Field, located in the northeastern part of the area, was established as a training field for British RAF pilots during World War II and was transferred to the city at the end of the war. Falcon Field has 605 aircraft based there. Boeing builds the AH-64 Apache attack helicopter at a facility adjoining Falcon Field. Phoenix-Mesa Gateway Airport is located in the far southeastern area of the city, and provides alternate but limited air service when compared to Sky Harbor International Airport. Phoenix-Mesa Gateway was formerly Williams Gateway Airport, and before that, Williams Air Force Base, which closed in 1993. Williams Gateway was announced as a new Focus City for Allegiant Air. Service started October 25, 2007. George Nicholas Goodman a pharmacist who was the mayor of Mesa for 5 different 2 year terms as part of 3 different decades. ^ "Mesa, Arizona, USA - Monthly weather forecast and Climate data". Weather Atlas. Retrieved 11 April 2019. ^ "U.S. Census Bureau QuickFacts: Mesa city, Arizona". www.census.gov. Retrieved 2019-02-17. ^ "City of Mesa 2015 Comprehensive Annual Financial Report" (PDF). City of Mesa. p. 151. Retrieved March 24, 2016. ^ "National Register of Historical Places - Arizona (AZ), Maricopa County". nationalregisterofhistoricplaces.com. Retrieved November 10, 2018. ^ "Red Mountain Park" Archived September 1, 2013, at the Wayback Machine City of Mesa, Arizona. Retrieved on July 9, 2013. ^ "Arizona Private Country Club | Mesa Country Club | Private Golf Near Phoenix | Phoenix Arizona Private Golf Course, Wedding Venue". mesacountryclub.com. Retrieved November 10, 2018. ^ "Superstition Springs Business Park Trades for $13.98M". AZ Big Media. Retrieved June 4, 2015. ^ "Our History". Mission Community Church. Retrieved June 4, 2015. ^ "What is the state of higher education in Mesa, Gilbert?". azcentral.com. Retrieved November 10, 2018. ^ a b Leatherman, Benjamin (August 6, 2014). "The 15 Biggest Rock Stars Who Live in Arizona". Phoenix New Times. Archived from the original on August 8, 2014. Retrieved September 15, 2014. ^ "98 players born in Arizona". Baseball-Reference.com. Archived from the original on July 5, 2014. Retrieved December 30, 2016. ^ Steenblik, Rachel Hunt; Wheelwright, Hannah (2015). Mormon Feminism: Essential Writings. Oxford University Press. p. 196. ISBN 9780190248031. ^ "NBA Coach Mike Brown Began Career at MCC". Alumni & Friends. Mesa Community College Alumni Association. Retrieved February 10, 2017. ^ "Austin Gibbs Releases His Monumental 'EP' through 101 Distribution". PR Web. April 30, 2009. Archived from the original on October 5, 2012. Retrieved September 16, 2014. ^ "George N Goodman, Fair Secretary, Dies". Arizona Republic. Retrieved 9 January 2019. ^ "87 Jamar Hunt". University of Texas, El Paso. Archived from the original on October 19, 2012. Retrieved December 30, 2016. ^ "Albie Lopez". Baseball-Reference.com. Archived from the original on July 3, 2014. Retrieved December 30, 2016. ^ "Carolyn Morris". Baseball-Reference.com. Archived from the original on November 8, 2012. Retrieved December 30, 2016.